Yup, another “green” recipe! (I promise to switch it up next week). Anyway, back to hard boiled eggs. Easter was the only time I had hard-boiled eggs as everyone was too lazy to make them any other time of year. Even now, I rarely eat them. I’m not going to lie, I loved the egg white, but I was not a big fan of the dry yolk- too much coughing. Deviled eggs though? I like. Avocado eggs? I love! And I’ve been egg-perimenting (har har) with cooking eggs in the oven. I’m proud to say I’ve perfected it! Happy Easter! 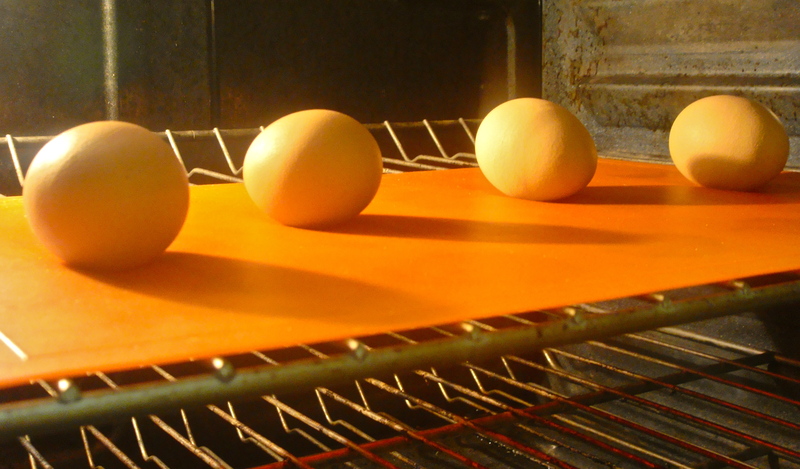 To “Hard Boil” Eggs: Place a silicone mat directly on the middle oven rack. Preheat the oven to 325 degrees. Carefully lay eggs the mat and between the bars to ensure that they do not roll around. *See below for picture*(Likewise, you can place a cooling rack in a baking pan, place a silicone mat over cooling rack, and then place the whole thing in the preheated oven.) Bake for 25 minutes. With a oven mitten, remove eggs one by one and carefully place on top of a pot holder or towel. Let cool for 3 minutes. Carefully transfer into ice water for 10 minutes. 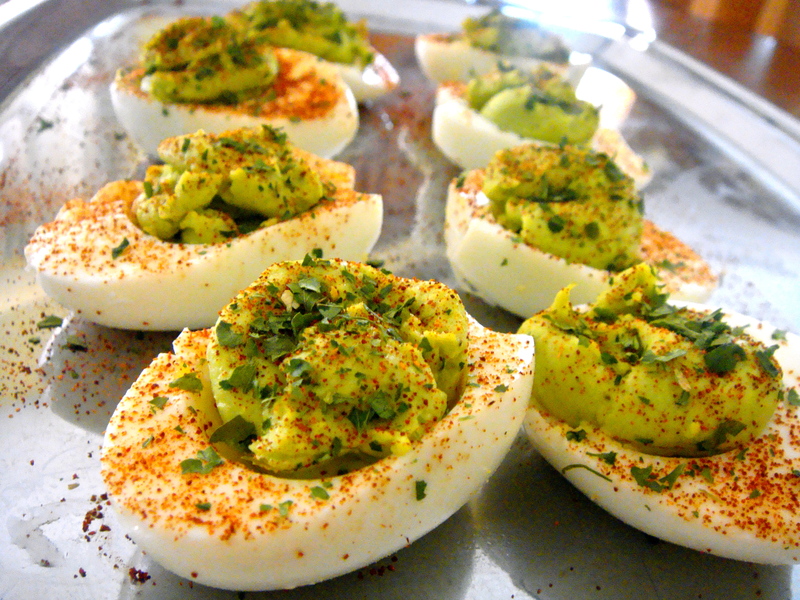 Avocado Deviled Eggs: Peel off egg shells and cut eggs in half. Remove egg yolks. 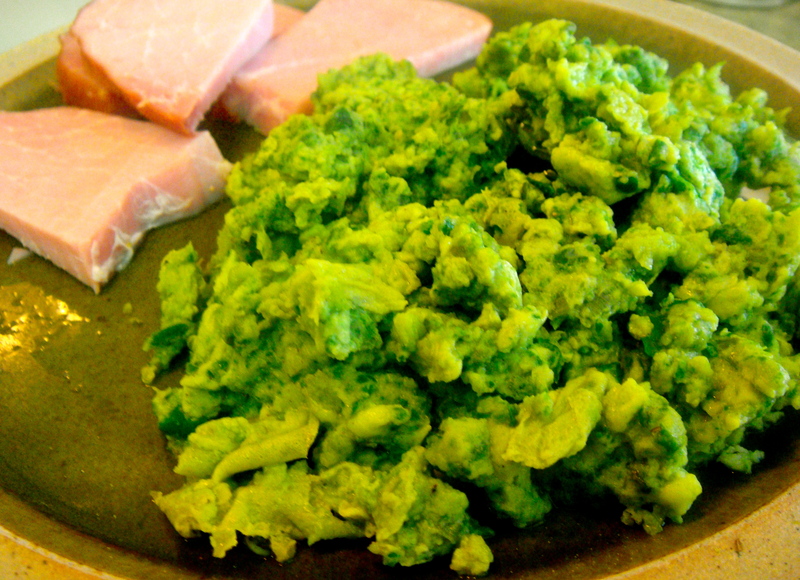 In a food processor, combine yolks, avocado, lemon juice, mustard, paprika, parsley, and salt and pepper together. Transfer to a ziplock bag, snip one of the corners, and squeeze into the egg white “cups.” Top deviled eggs with more paprika and parsley. Chill in the refrigerator until ready to serve. St. Patrick’s Day may be over, but who says the green has to stop? 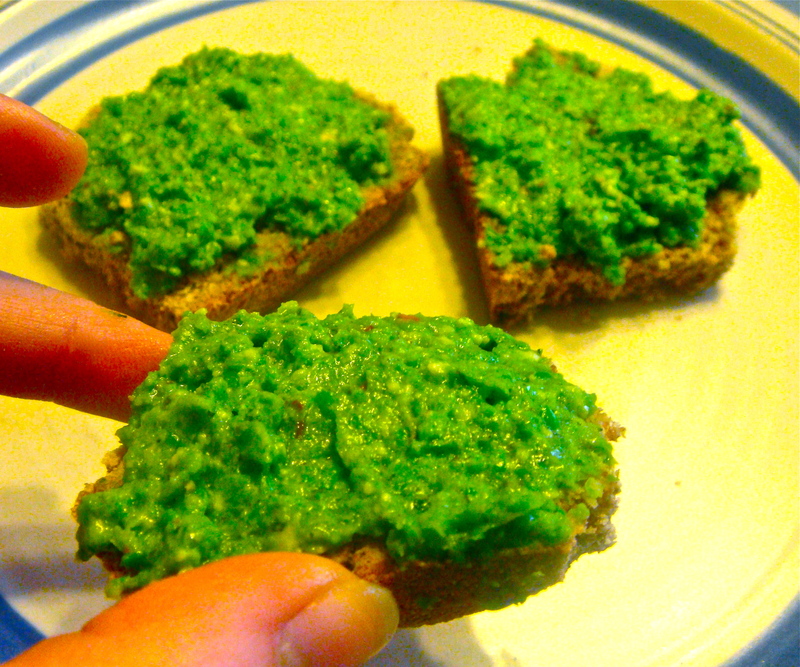 I was so surprised with the color I got from these smashed peas- it gave off such a bright green! What can I say? I’m a sucker for pretty colors. I’ve made this several times now and I found that this works as a dip, side dish, or spread (as pictured on top of my Irish Soda Bread). Besides the color, I love the refreshing and cool temperature. It makes me crave summer. Pool-side snack, perhaps? Place peas in a stainer and run under warm water until slightly soft. Put peas and the rest of the ingredients in a food processor and process until smooth. Either serve as a dip, spread, or side dish. Yup, a St. Patrick’s Day recipe. 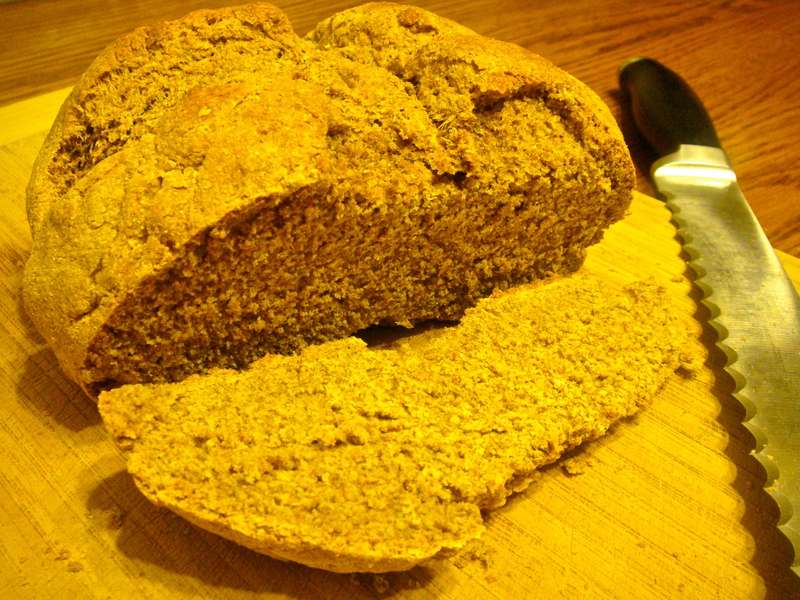 Instead of going all out and fancy though, I wanted to make the most basic Irish Soda Bread possible. This means no sugar, raisins, or butter (but feel free to add some if you want more of a dessert bread 🙂 ).Of course this is not a complete traditional bread (I can’t help but to put my own spin on things). I used my own “buttermilk” recipe (milk + vinegar) and somehow, I don‘t think the Irish used spelt flour all that much. Since this recipe is so basic, I’ve been using it a lot for sandwich bread and I even made a bread bowl with it! Mix milk and vinegar together in a small bowl. Let stand for 10 minutes. Meanwhile, preheat the oven to 375 degrees. In a large bowl, mix together flours, baking soda and salt. Create a well in the middle of the mixture and pour in milk. Mix altogether and knead with your hands into a ball. If too dry, add a SMALL amount of milk. Place on an ungreased baking sheet and press down slightly until your hands just cover the dough from sight. Cut an X in the bread, 1/4-1/2 inch deep. Bake for 40 minutes. Serve upon taking out of the oven. Store in a sealed ziplock bag. I’ve recently learned that most people have no clue what Irish Potato (Candies) are. Upon looking it up, I found that it’s a treat that has originated (and stayed) in the Philadelphia area. Since I’ve always lived in NJ, I just figured that they were as universal as cookies or cupcakes. My bad. (While I’m on the subject, does anybody know what a hoagie is? I’ve used the term “hoagie” my whole life- yet, when I went to NY, nobody had any clue what I was talking about. It’s so strange how dialects work). Anyway, back on topic. For those who don’t know, Irish Potatoes become popular where I live every March, around St. Patrick’s Day. Growing up, homeroom mothers would always make them for any classroom parties we had in March. 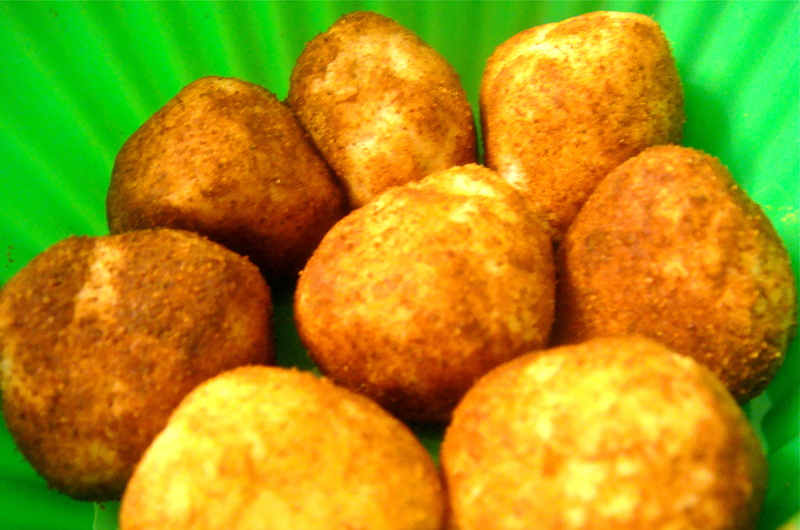 Typically, they are small potato-shaped treats made with lots of powdered sugar, coconut, cream cheese, butter, vanilla, and cinnamon. They are neither potatoes or Irish. Regardless, it’s one of those things everyone eats around this time of year, kinda like the Shamrock Shakes. To find the recipe for this, you can just google it. When I began cooking for myself, however, I became turned off by the ingredients used to make these “potatoes.” Instead, I’ve made my own “potatoes.” Since this candy is not an Irish tradition, I feel no guilt with remodeling it. And I mean by a lot. So, does it taste like the Irish Potato candy? A little. More important, does it taste good? Yup. Still, if you have eaten Irish Potatoes before, don’t expect the stuff you find in the stores. If you’ve never had it and have nothing to compare it to, feel free to still try. Hey, you can’t miss what you never had, right? In a SMALL food processor (unless making a big batch), combine coconut butter, protein powder, and vanilla. Blend until creamy. Place in the fridge for a couple minutes to harden slightly. Roll into little balls. Sprinkle cinnamon on top and roll until coated. Keep at room temperature. 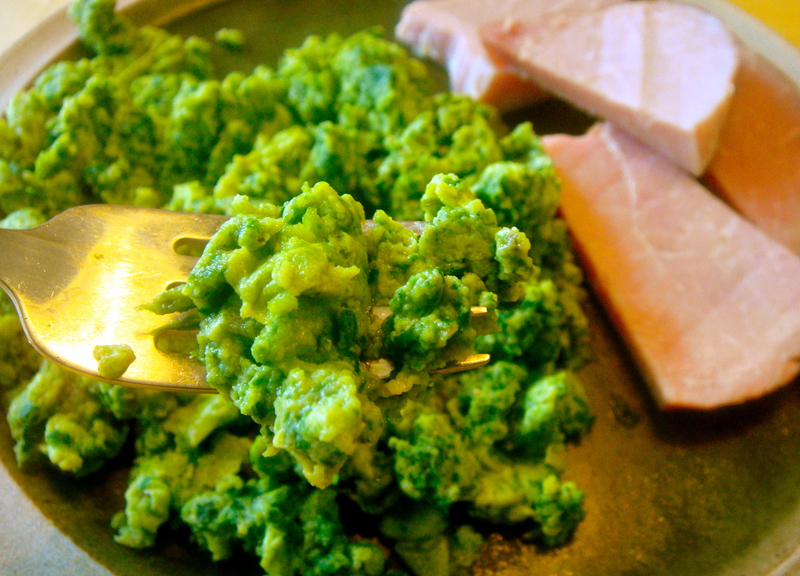 In a food processor, puree all ingredients together until green throughout (this will make the eggs bubbly. Don’t worry, it’ll go down while cooking). Then, simply scramble the eggs as you normally would do. Serve with ham, if desired. Who says green eggs are only for kids anyway?